Religionists account for 88.4% of the world’s population in 2013, up from 80.8% in 1970, according to the book. You can read more in the ESSSAT discussion forum here, where you can also participate in the discussion. How Religion Transformed Cooperation and Conflict, Kindle edition, location 3800, p. 192. 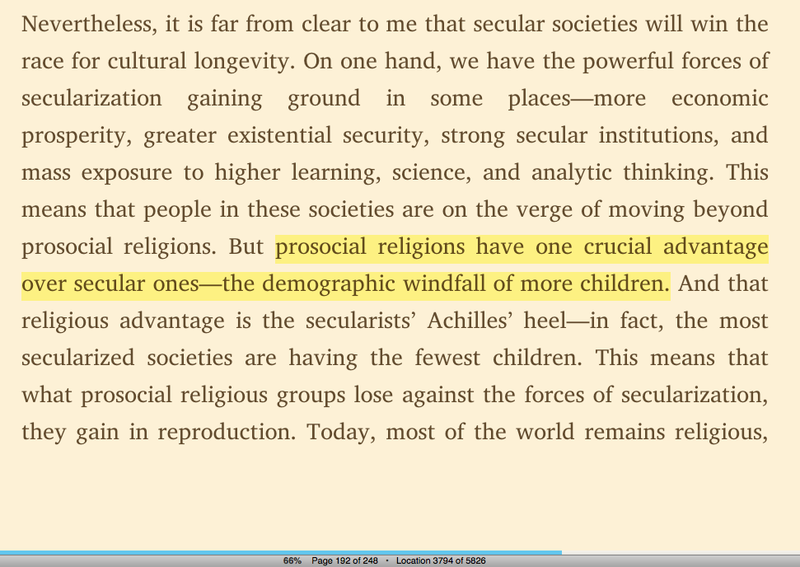 My second thought was: the significance of these numbers lies not in their importance for a supposed competition between atheism and religiosity, as Norenzayan seems to suggest, but in the fact that they confront us, western scholars of religion, working in a secular context, with a broader perspective in which religion is not relegated to the margins of culture. Numbers like these make it all the more important to understand religion, its origin, its (evolutionary) history, its present role in human culture, etc. This is, to be fair, also Norenzayan’s point in his concluding remarks, but I would not be a theologian if I were to agree with him that we need to go beyond religion. On the contrary, I hope a dialogue between religious studies scholars and theologians of different religious traditions will lead to a form of consilience, enriching both secular and religious people’s understanding of religion. Posted in Uncategorized. Tagged atheism, cultural evolution, Culture, faith, pluralism, religion.